In June 2012 Coillte supported by Failte Ireland launched their Off Road Cycling Strategy. In this document, Coolaney, Co Sligo was identified as a potential National Mountain Biking Center. As a result a Steering Group was established in Sligo to develop Coolaney National Mountain Bike Park. The group now has a Feasibility Study and Corridor Evaluation (sponsored by LEADER and local businesses) which advises that there is a fantastic facility in the Northwest suitable for 76kms of 100% pure single track mountain biking trails and 3.5kms fire road. At this scale the park would be a multi-day destination for families and MTB enthusiasts, with massive economic benefits for the region (projected at 2.2m pa). Located 35 minutes from Knock Airport and on the Wild Atlantic Way, it is well regarded as being a perfect fit for the Northwest’s existing recreational attractions – surfing, walking, equestrian etc. Other comparable sites attract 50,000+ visitors pa (Ballyhoura, Ticknoc, Rostrevor etc) and based on 76kms of single track this would be the largest and most attractive offering in Ireland. Our site will have access to the top of the mountain with sensational views overlooking the Atlantic, Easkey, Ballisodare Bay, Strandhill, Knocknarea and Benbulben. It will have enormous economic and commercial benefits for the region, attracting visitors to the Northwest from the UK and Europe. The group is now at the funding stage for the overall facility with €5.4m required to turn this into a reality. Various funding streams e.g. INTERREG and Cross Border are being investigated. Sligo County Council has engaged a funding consultant to navigate the various European funding options. Ultimately, the Steering Group believes it will be primarily funded via capital funding from the Government. The group have a business plan and an economic feasibility study completed and will be presenting same to Minister Paschal Donohoe and Minister Michael Ring in the coming weeks. Coillte is offering the facility and have been incredibly generous and supportive in helping drive the project forward. The Coolaney National Mountain Bike Trail Steering Group is asking for your support to help promote the campaign and and turn the project into a reality. The campaign is to develop a world-class 80km National Mountain Bike Trail Centre consisting of 76km of single track cycling trails and related facilities in the Coillte-owned Coolaney Forest on the Ox Mountains and along the Wild Atlantic Way. This would be the only such facility in the Northwest region and one with potential to be the largest, most exciting mountain biking centre on the island. Identified by Coillte for a National Centre, the proposed site is in an area of stunning natural beauty stretching from the Wild Atlantic Way to the Sligo Way. Adjacent to the N17 (Sligo-Galway), the Coolaney site is 15 minutes from Sligo, 40 minutes from Knock Airport, 2 hours from Galway and 2.5 from Dublin. Sligo, a Fáilte Ireland-designated Adventure Hub, is a key regional transport centre with a growing status as Ireland’s Adventure Capital for outdoor activities, and all the essential services, infrastructure and attractions required by visitors. A Feasibility Study and Corridor Evaluation carried out by internationally recognised trail designer Dafydd Davis estimated the overall cost of designing and developing 80km of biking trail at €5.8 million, excluding vat. Estimated annual maintenance costs of €33,000 to be met by locally generated income. Led by the sole landowner, Coillte, who initially identified the suitability of the site for a mountain biking centre of national importance, the project Steering Group also includes representatives of Sligo County Council, Local Enterprise Office, Sligo LEADER Partnership, the local community and Northwest Mountain Biking Club. The project has received significant support from all regional development agencies, national and international cycling and mountain biking enthusiasts, clubs and businesses, and the local community. Since 2012 the Group have been promoting and working towards establishing the National Mountain Bike Trail Centre. They have consulted widely with the local community, enthusiasts, businesses and statutory bodies in relation to the project. 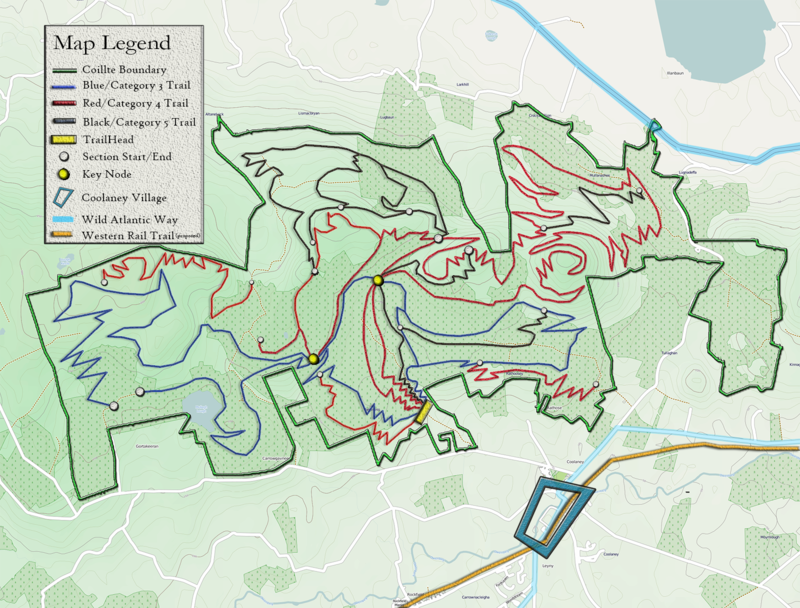 With Sligo LEADER support, the Group commissioned a Feasibility Study and trail Corridor Evaluation for the Coolaney site, which confirmed the suitability of the site for a mountain biking centre of world-class standard. The Group has also promoted the project on an international basis generating considerable interest in and support for the National Mountain Bike Trail Centre from a very receptive world-wide audience.